Skin camouflage was pioneered during the Second World War to help pilots who had been badly burned by making use of plastic surgery and camouflage creams. During the 1950s Joyce Allsworth researched and implemented the concept of remedial skin camouflage in the UK. She went on to form the British Association of Skin Camouflage (BASC). Skin camouflage is defined by the (BASC) as being, “the art of concealing a discolouration, blemish or scar with the application of specialist camouflage creams that are matched to the surrounding skin tones”. 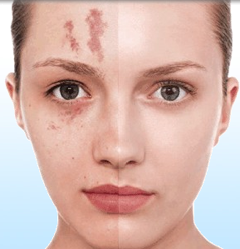 Non-contagious skin conditions (dermatoses) and scars are the result of many and varied causes, but can have a devastating effect on the sufferer. Although skin camouflage cannot alter the structure of the skin, the immediate visual effect can help greatly with a person’s self-esteem. Alicia is a fully qualified Skin Camouflage Practitioner and a member of BASC, the Skin Camouflage Network (SCN), Changing Faces and Varama. She has a great empathy in this area and deals personally with anyone seeking a consultation. This involves a personalised colour match, and instructions on how to apply the camouflage cream, manage it during wear and removal. Alicia will then give advice on how and where to obtain the products. Alicia is also on the register for expert witnesses for solicitors and surgeons. Alicia has extensive experience in providing medico-legal reports. Alicia is a listed medico-legal expert with APIL (the Association of Personal Injury Lawyers) . If you are a solicitor, insurance company or rehabilitation company seeking expert evidence in assessing the lifetime affects. Faulty products. E.g chemical, cosmetic, exposure, burns. Please do get in touch with Alicia. Alicia runs consultations at her clinic in West Sussex or she covers Sussex, Surrey, Kent, London,Oxford, Birmingham and Northamptonshire. Consultation fees vary but starting at £50 dependant on location. I can’t thank you enough for coming to see me for a consultation, I have spent years so embarrassed about my problem and never told anyone about it, since my skin camouflage consultation I am now able to enjoy life without feeling like everyone is looking at me and judging me. Thank you for teaching me techniques to make the application so quick and easy for me to apply daily. Thank you Alicia for coming to see my daughter and show her how to cover her scars it’s made a huge difference to her confidence, she is now looking forward to the summer and going on holiday without having to keep covered up.